Not enough time to do your home classes? The Fire Sequence is for you. The Fire Sequence is your daily 3- 5 minute class for the next 7 days. Practiced daily, these short but tough classes will help you to get strong, to build courage. You'll become a firebrand, transforming stagnant energy, releasing and letting go whilst building strength. Not suitable for during pregnancy or if you have lower back pain. These classes are for those of us who want to build up physical and mental strength, stamina and courage. You will transform, like the Phoenix - your physical and mental energy will surprise you with these very short classes. These classes are perfect for when is you need to feel strong, to build up your inner strength, inner fire and courage. Perhaps you have a job interview coming up or some other big date. 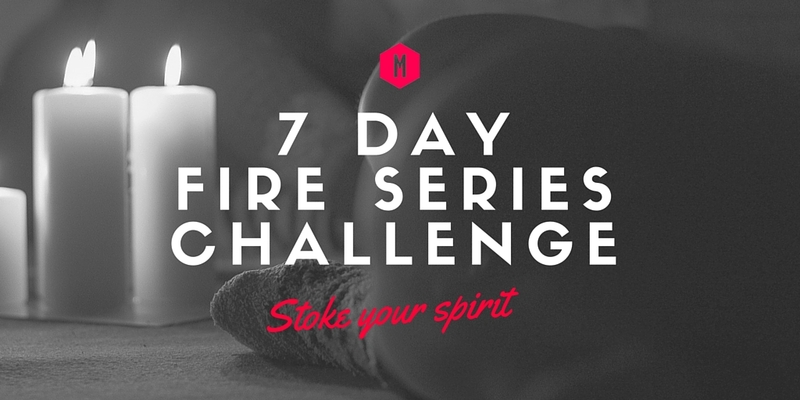 Take the Fire Challenge in the run up to help you be at your strongest and your best on the day. Perfect as well for when you are starting anew, you will slough off old, negative energy and emotions and bring in your new-found strength. Choose a week and commit to doing Andrea’s 4-minute core exercise video each day. Do each exercise twice, daily. Designed to be used in addition to your other yoga practice, even when you are pushed for time you should always be able to find 4 minutes for the Fire Challenge! To start with we challenge you to commit to 4 minutes a day of fiery core work! All the exercises are performed lying on your back and focus on the navel centre which is an area with a vortex of energy behind it. As each day passes you will be releasing this energy into your system and feeling stronger both physically and mentally. Any negativity from the past will be burnt off as you transform each day. This is a strong set of exercises, so you need to be mindful of your ability. If you have any lower back concerns or you are not feeling strong, please take the modifications that Andrea offers, and if there is any pain at all, please do not do these exercises. If you are pregnant, these exercises are not suitable for you. Also if you have any history of hernia or ulcers, please take advice from your doctor before doing the practices. Andrea has been doing this series for over 20 years and she can’t recommend it enough! We are so excited to be sharing this simple but effective method to develop strength, stamina and courage. Let’s go! The first in a series of 7 yoga classes inspired to bring you 'fire', a practice for strength, stamina, courage and focusing on reducing your ego. These practices focus on the core. The first in the fire series is a short abs workout, designed to make you feel firey and ready to go! Practice all 7 on consecutive days for maximum fire. Next up: Fire Challenge Day 2. We also recommend watching Andrea's introduction for a full understanding of the Fire Series. The second in a series of 7 yoga classes inspired to bring you 'fire', a practice for strength, stamina, courage and focusing on reducing your ego. These practices focus on the core. The second in the fire series is a short abs workout, designed to make you feel firey and ready to go! Practice all 7 on consecutive days for maximum fire. Next up: Fire Challenge Day 3. We also recommend watching Andrea's introduction for a full understanding of the Fire Series. The third in a series of 7 yoga classes inspired to bring you 'fire', a practice for strength, stamina, courage and focusing on reducing your ego. These practices focus on the core. This is another short abs workout, designed to make you feel firey and ready to go! Practice all 7 on consecutive days for maximum fire. Next up: Fire Challenge Day 4. We also recommend watching Andrea's introduction for a full understanding of the Fire Series. The fourth in a series of 7 yoga classes inspired to bring you 'fire', a practice for strength, stamina, courage and focusing on reducing your ego. These practices focus on the core. This is a really tough but short abs workout, designed to make you feel firey and ready to go! Practice all 7 on consecutive days for maximum fire. Next up: Fire Challenge Day 5. We also recommend watching Andrea's introduction for a full understanding of the Fire Series. The fifth in a series of 7 yoga classes inspired to bring you "fire", a practice for strength, stamina, courage and focusing on reducing your ego. These practices focus on the core. This short abs workout is all about going slow and staying in control with a movement called "the bicycle". Practice all 7 on consecutive days for maximum fire. Next up: Fire Challenge Day 6. We also recommend watching Andrea's introduction for a full understanding of the Fire Series. The sixth in the series is a little bit tougher, so even when you're short on time there's no need to forgo your firey core practice. Enjoy the extra strength and fire in your body and mind from these hard-core exercises! Practice all 7 on consecutive days for maximum fire. Next up: Fire Challenge Day 7. We also recommend watching Andrea's introduction for a full understanding of the Fire Series. The final in the series is a strong core work out to build your inner courage and fire. Mix up day 6 & 7 and repeat if you wish to take the practice deeper! We also recommend watching Andrea's introduction for a full understanding of the Fire Series.